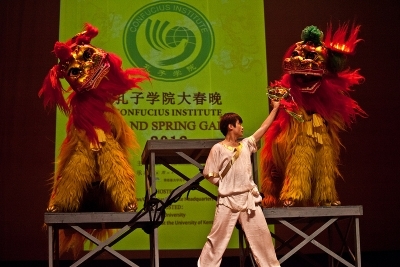 The University of Kentucky Confucius Institute (UKCI), established for only two years, was named the 2012 Confucius Institute of the Year in December. Awarded by the Office of Chinese Language Council International (colloquially known as the Hanban), the honor distinguishes the UKCI among the more than 430 Confucius Institutes in 115 countries; there are approximately 90 Confucius Institutes in the U.S. UKCI director Huajing Maskeand interim Provost Tim Tracy accepted the award at the seventh World Confucius Institute Conference in Beijing, along with 25 other institutions around the world that also received the honor. "It is a tremendous honor for the University of Kentucky and our Confucius Institute to receive this award," Tracy said. "The recognition is particularly gratifying as our Institute was only established two years ago. The receipt of this award is a testament to the hard work and leadership of Dr. Huajing Maske and her team as they have made a significant impact on international efforts on our campus and with relationships at universities across China." In the past two years, the UKCI facilitated partnerships with eight Chinese universities and institutions. Maske said this acknowledgment will help the institute to establish even more collaborations. "This puts UK's name with the top 3 percent of the more than 430 universities in 115 countries," Maske said. "This means that UK's name is known to most of the 1.3 billion Chinese people who watch Chinese TV and who read the Chinese newspapers. What's more, we have been reported in the recent People's Daily overseas edition which means more people living outside China also read about us." The scope of the award highlights how the impact and influence of the UKCI go beyond Kentucky. As the key facilitator to UK's China exchanges, the institute also helps colleges identify and develop their strategic China partnerships with reputable Chinese universities. These partnerships create tremendous opportunities for research and teaching for faculty, as well as scholarships and study opportunities for students. By assisting colleges in establishing these strategic collaborations, the UKCI plays a key role in attracting excellent Chinese students and in contributing to the Chinese experience of UK students to enhance their success as 21st century students with a global outlook. The UKCI has brought more than a dozen distinguished speakers to UK to speak on various topics related to China. Its Chinese Medicine Week in November went beyond the UK campus to Transylvania University, the Chinese community and the Lexington Public Library. In fewer than two years, the UKCI demonstrated strong leadership in the Chinese language and culture programs in Kentucky's K-12 schools. The institute sent out specialized instructors to public schools, and helped Woodford Public Schools to jumpstart a Chinese program in every school, granting more than 2,000 American students the opportunity to study Chinese language and culture. The institute also conducted 15 different Chinese teacher training workshops, the largest one attracting 150 Chinese teachers from 16 different states. Maske said that strong Chinese programs in Kentucky's K-12 schools will ensure a pipeline of students entering UK with higher levels of Chinese proficiency, enhancing UK's Chinese major. In addition to the works on campus and in the public schools, UKCI has worked with more than 10 organizations in the community and conducted dozens of events and activities on Chinese art and culture. 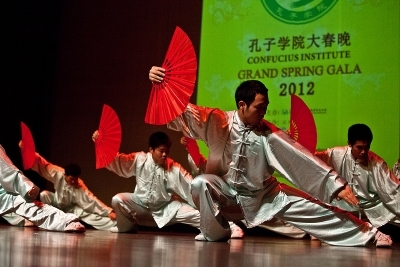 UKCI’s Spring Gala, with excellent performances brought all the way from China, has become a popular annual event in Lexington. "The most important work UKCI conducts is the work that connects UK’s colleges to China, because this work contributes to UK’s core value and mission, which is students’ and faculty success," Maske said. "The partnerships with China create the kinds of opportunities for faculty and students to succeed in today’s global world. Our work helps UK create differentiated graduates that excel in academia and research, embrace global outlook and seek international experience." 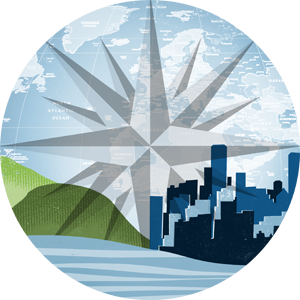 Practically speaking, the award is not only an acknowledgment of the UKCI's excellence in the past years, but it will also result in more program funding and resources. This will allow the institute to expand services and programs on the UK campus and in the community. "I'm confident that even greater impact will be realized upon our campus because of what this institute provides to enrich our students' experiences and prepare them for an increasingly global economy and society," Tracy said.